change is in the air for the Hungry for Living blog – more exciting new-ness to come – stay TUNED! anyways… back to garden talk – my initial plan to keep the crimson clover growing in the raised beds amidst the seedlings didn’t quite go as i had planned. i pulled some out of the way to get the beets, scallions and carrot seeds started a couple of weeks ago, and MAN were those babies’ roots thick and deep. no matter how well you think you made a nice little clearing for your seeds to begin germinating, the clover creeps its way back up with vengeance! in this bed last year i had corn. with such a small plot to work with and the area needed to properly grow corn, it just didn’t make sense to me to do it again – especially since my two bro’s are growing it too. i smell a midnight garden raid in my future :0) THIS YEAR it’s tomatoes, peppers, lettuce, beets, carrots and scallions – companion growing anyone?! 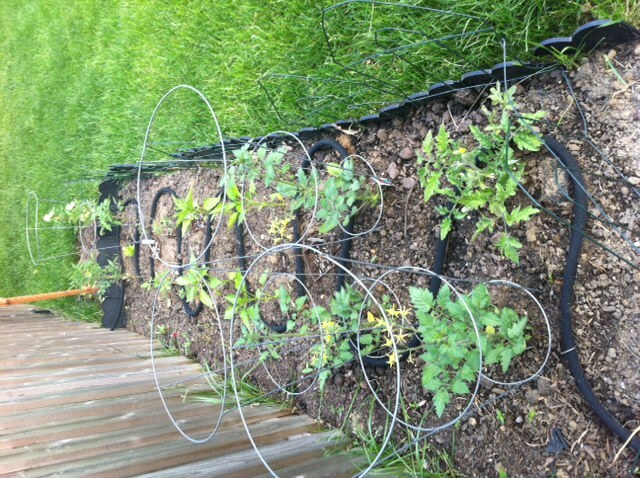 i think i ended up with about 4 different tomato types, some determinate, some indeterminate. in these beds i have the rest of the crew growing along. 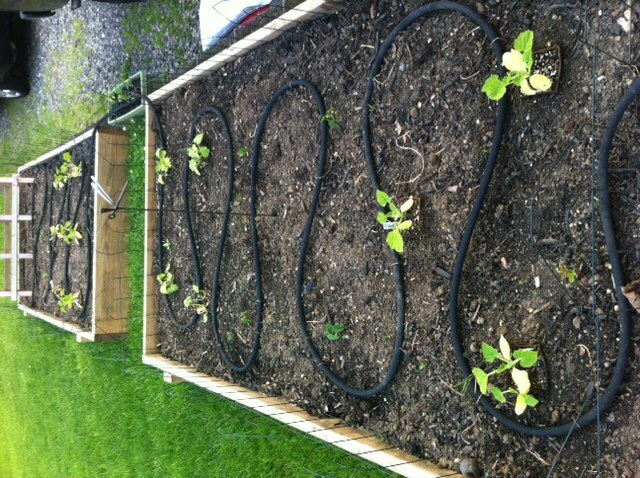 zucchini, yellow squash, bush beans, onions, cucumbers, butternut squash and spaghetti squash. 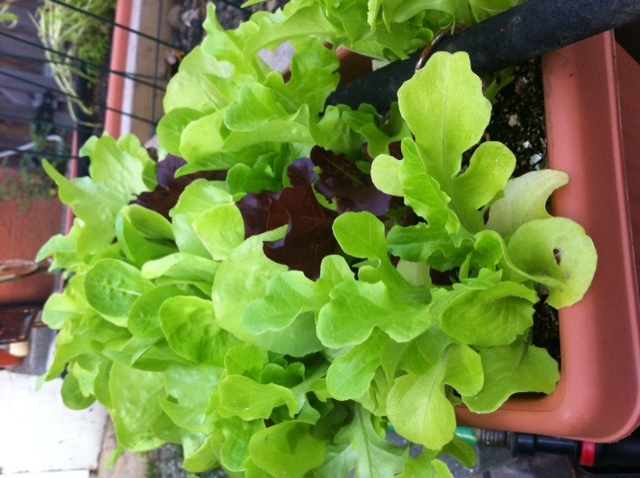 im keeping the field green lechuga in pots and so far they’re doing really well. i do a big clipping about once a week and it just keeps coming back up. so SOOO tasty to dig into a big ol’ bowl of fresh greens, that will never get old in my book! pots = being able to move them into the shade when i know it’s going to be a scorcher of a day. the head lettuces are planted under the tomato plants in hopes of them providing the shade they will need in the summer… experiment much?! notice the black snakes weaved through the beds this year? yeah – soaker hoses… what a concept!! i think i thanked the person who invented them about 500 times while i was setting them up. WHY did i not think of doing this last year?! you live and learn. the fruit department is EVERYWHERE! i don’t judge when it comes to where a garden can be grown. i have strawberry plants blowing up at a rapid rate amidst my wildflower garden in the front yard. it’s so exciting to come home after work and pop those little red gems off their vines! raspberries and grapes are growing along the fence in the back yard. blackberries, watermelon and blueberries are in the side yard. no product from any of them yet, but i’m sure once i hit max capacity on my strawberry intake, they’ll start fruiting up! I have a bunch now, can drop off tonight. You get it started?